Cyclones are an inescapable feature of living in a tropical climate like Queensland. Since 1858, over 208 of these destructive rain and wind storms have lashed the east coast. The environmental, economic and psychological costs to communities, families and individuals caught in their midst are often colossal and enduring. However, beyond these primary impacts, it is interesting to look historically at how cyclones have dramatically shaped urban landscapes as communities rebuild out of the ruins. A case in point is North Queensland, and more specifically the townships of Mackay and Innisfail. Although both were settled by Europeans in the mid to late 1800s as part of a policy of frontier expansion, their town centres exhibit a distinctly modern, twentieth-century aesthetic with some of the best collections of Art Deco buildings in the state. Like other communities around the world renowned for their concentration of Art Deco structures – such as Napier in New Zealand and South Beach in Miami – natural disasters intervened to drastically change Mackay and Innisfail’s architectural course. With a virtual ‘blank slate’ to work from, the gradual rebuilding of the town centres of Mackay and Innisfail in the 1920s and 1930s saw a new type of design aesthetic emerge – one we now recognise as Art Deco. This marked a significant departure from the quintessentially Queensland ‘timber and tin’ aesthetic that had gone before, and was a sign of the times as Art Deco sensibilities permeated the architectural world. Timing had everything to do with the rise of Art Deco in North Queensland – had the cyclones struck in a different era when alternative architectural tastes dominated, Mackay and Innisfail would look very different today. However, there were other factors at play that also prompted the turn to this particular design school. A critical one was the need to rethink the type of construction materials used, as it became clear in both towns that most structures to survive the cyclones were made of concrete or brick. Art Deco design – epitomised by an embrace of new materials such as reinforced concrete – was not only attractive from an aesthetic point of view, but also from a pragmatic need to ‘cyclone proof’ the towns. Not wanting to leave much to chance, the Queensland Government worked in consort with local councils to stipulate the types of building materials and structures that would be permitted in town centres. This was accomplished through amendments to the Local Authority Act 1902, allowing councils to pass by-laws that divided town centres into First Class and Second Class zones, the former requiring the use of much sturdier, fire-proof materials in construction. In 1925, Johnstone Shire Council proclaimed Edith and Rankin Streets in Innisfail as First Class areas, effectively creating a building environment centred on reinforced concrete. A year later, in 1926, Mackay Council followed suit, necessitating in its by-laws that buildings in the First Class area must be constructed of reinforced concrete, stone or brick. The building of structures that drew on the most up-to-date design ideas and materials was not a cheap undertaking, making wealth another factor explaining Mackay and Innisfail’s turn to Art Deco. Despite the inevitable set backs to industry brought on by the cyclones, both towns were economically prosperous as leaders in sugar production. This prosperity was in turn reflected in the grand Art Deco structures that materialised as the towns recovered and rebuilt. The legacy of the cyclones and their aftermath for North Queensland is a rich Art Deco heritage. Today Mackay boasts at least 14 Art Deco buildings in the centre of town, clustered around Gordon, River, Sydney, Victoria and Wood Streets. Key figures who contributed to this streetscape include local architect Harold V.M. Brown who designed numerous buildings through the 1930s, and local builder William Guthrie who was active from the mid 1920s to the 1940s. The services of other Queensland architects were also called upon, such as Brisbane’s Lange L. Powell and Bundaberg’s F.H. Faircloth. Among the many examples of Art Deco splendour in Mackay are the Ambassador Hotel (1937), Chaseley House (1937), Australian Hotel (1940) and Wide Bay Australia House (1942). Innisfail’s CBD prides itself on having one of the largest concentrations of Art Deco buildings in Australia, predominately along Edith and Rankin Streets. Over half of the 55 commercial buildings constructed between the early 1920s and early 1940s exhibited Art Deco features. The Van Leeuwen brothers who settled in Innisfail around the time of the cyclone played a particularly crucial role, bringing with them sought-after skills in concrete construction and quickly establishing a reputation as the region’s most significant builders. One of their more renowned projects was the Johnstone Shire Hall constructed in 1938 and designed by another prominent North Queensland firm, interwar architects Hill and Taylor. With its decorative ceiling, leadlight panels and terrazzo floor, the building was compared in grandeur to Sydney Town Hall. Also of note are the regional influences that infuse Innisfail’s Art Deco structures. Many of the buildings have peaked roofs and wide verandas in a nod to the tropical climate, while some of the facades with their Mediterranean inflections (Italian, Spanish and Moroccan) are suggestive of the cultural diversity that characterised the sugar industry’s workforce. An interesting postscript to this story is the role that Cyclone Larry – a category five storm that devastated Innisfail in March 2006 – played in reigniting the town’s connection with its Art Deco heritage. Locals were inspired to return the town’s buildings to their former glory as one way of revitalising community identity. In some instances, the cyclone had ripped through post-war cladding to reveal forgotten Art Deco façades that were restored and repainted. In the case of the Johnstone Shire Hall, cyclone damage prompted extensive renovation to retain a centrepiece of local history. While the local preservation committee, Art Deco in the Tropics, had been established in 2002, the cyclone event four years later sparked a more concerted, community-wide effort to safeguard and celebrate Innisfail’s Art Deco heritage. This has continued since, with new structures such as the Jubilee Bridge, opened in 2011, embodying Art Deco-inspired features in their design. The experience of both Mackay and Innisfail demonstrates how complex history can be. The terrible weather events of 1918 undoubtedly wrought much devastation and suffering on the local community. At the same time, the recovery and rebuilding process that followed in the next two decades put a decidedly modern stamp on the urban landscape. Today this Art Deco heritage is embraced not only as an inextricable part of local community identity, but also as a compelling narrative about the rise of modern architecture in Queensland and the tropics. Planning a trip to North Queensland? Check out the Art Deco sights with these walking guides for Mackay and Innisfail. The Australian Hotel, Mackay, 2014. Photograph by Queensland Deco Project. River Street from the Customs House showing cyclone damage, Mackay, Queensland, January 1918. Courtesy of National Library of Australia. Cremorne Hotel after the cyclone damage, Mackay, Queensland, January 1918. Courtesy of National Library of Australia. 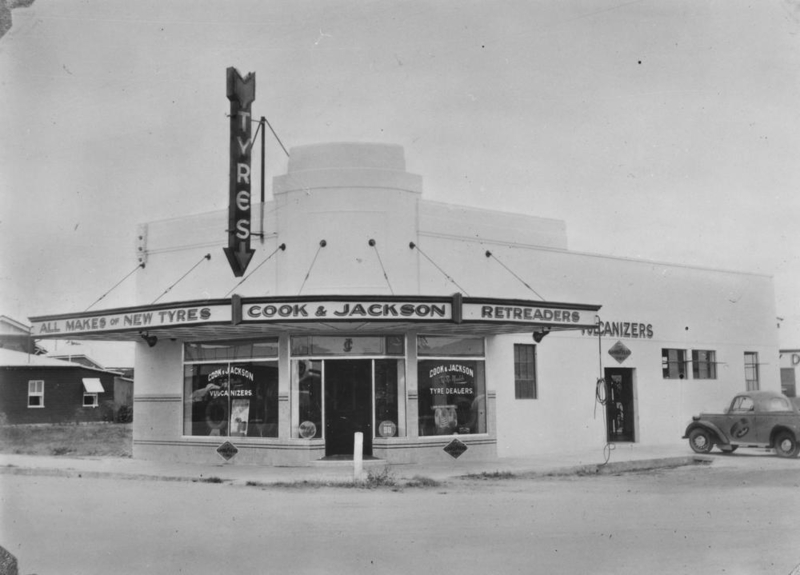 Premises of Cook and Jackson, a Mackay tyre and retreading business, 1939. Courtesy of State Library of Queensland. 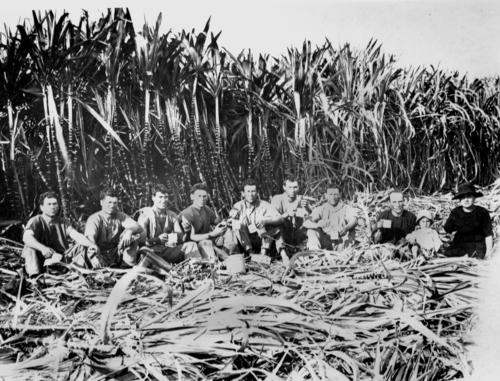 Italian sugar cane cutters, Innisfail district, Queensland, 1923. Courtesy of State Library of Queensland. The Australian Hotel, Makcay, 2014. Photograph by Queensland Deco Project. Wide Bay Australia House, Mackay, 2014. Photograph by Queensland Deco Project. 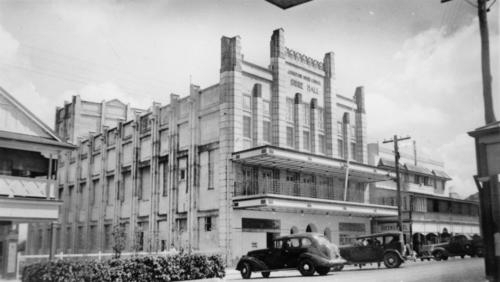 Johnstone Shire Hall, Rankin Street, Innisfail, Queensland, ca.1947. Courtesy of State Library of Queensland. 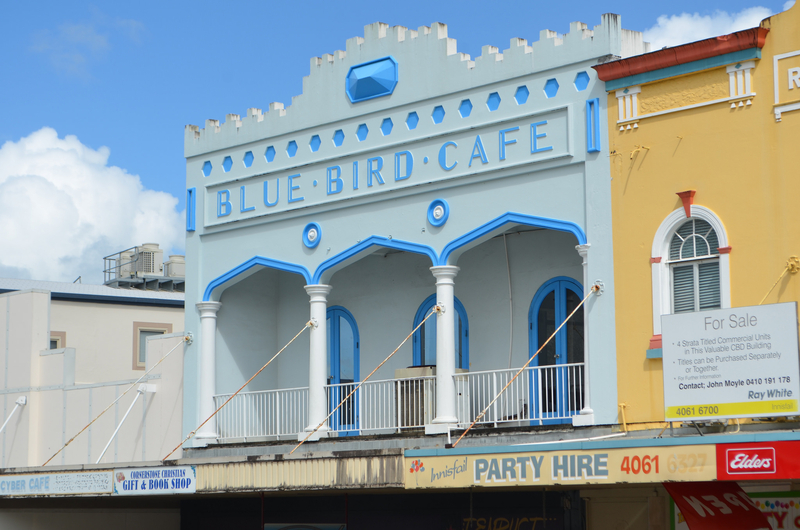 Blue Bird Café, Innisfail, 2014. Photograph by Mark. Licensed through Flickr under Creative Commons CC-BY. 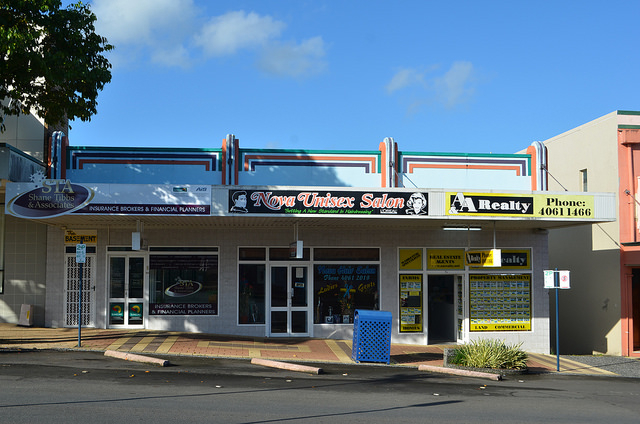 Art Deco shopfronts, Innisfail, 2014. Photograph by Mark. Licensed through Flickr under Creative Commons CC-BY. 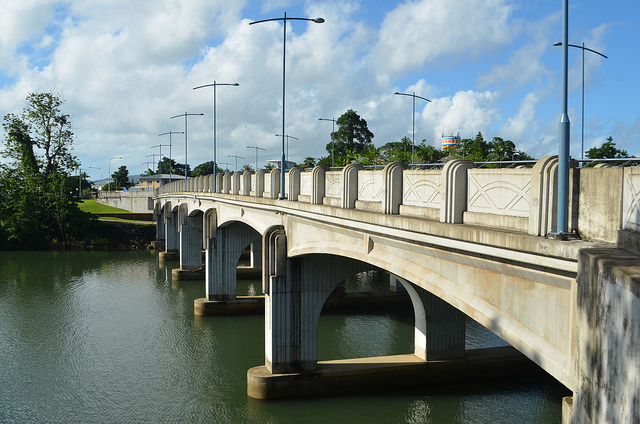 Jubliee Bridge, Innisfail, 2014. Photograph by Mark. Licensed through Flickr under Creative Commons CC-BY. Allom, Richard, Desley Campbell-Stewart and Helen Lucas. ‘History of Johnson Shire and Shire Hall.’ Cassowary Coast News (online). 2008. 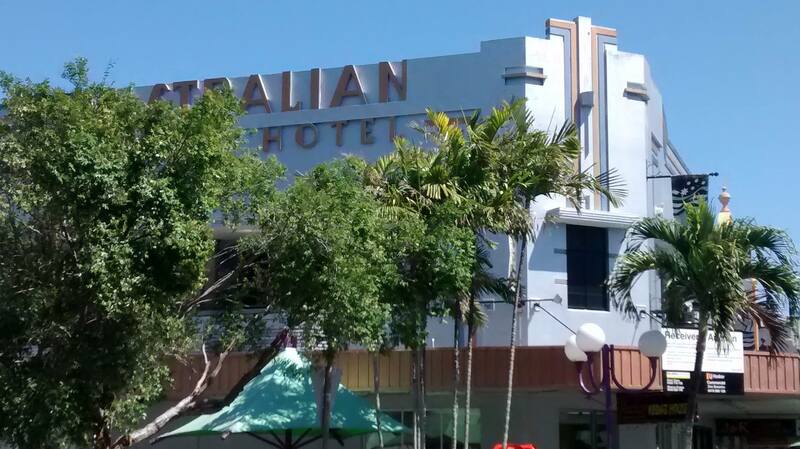 Art Deco in the Tropics: Innisfail (website). Accessed 23 February 2014. Bureau of Meteorology. ‘Historical Impacts Along the East Coast’. Accessed 23 February 2014. Dusting, Robert and Sandi Robb. ‘Extreme beginnings: The effect of cyclones on the development of Innisfail, Far North Queensland.’ ICOMOS Conference paper 2007. ‘Johnstone Shire Hall.’ Queensland Heritage Register. Department of Environment and Heritage Protection, 1995. Mackay Regional Council. 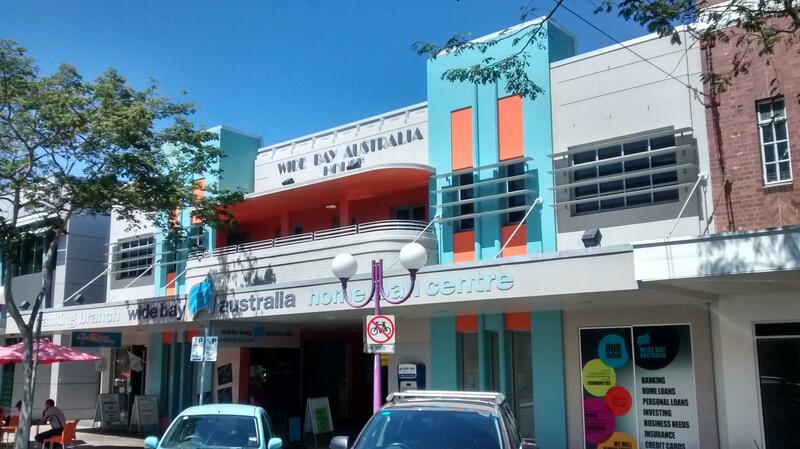 Art Deco in Mackay. 2011. ‘Mackay City Council special meeting’. Daily Mercury (Mackay). 17 December 1926, p.3. ‘Sadly Wrecked Countryside.’ The Brisbane Courier. 16 March 1918, p.6. ‘The Story of the Disaster: First detailed message by wire from Mackay.’ Brisbane Courier. 31 January 1918, p.7. A great article. And wonderful to see the Art Deco style continuing into 2011 with the lovely Jubilee Bridge. Who would have thought that out of devastation such delights grow? Great article, Iona, very timely. Enjoyed the article. Well-researched and well-written, and its good to see you refer to the damage by Larry revealing deco features previously covered up. A great story. Just love this story and the way it places history into context. Beautifully told, many thanks. I am sure that this blog will enable many visiting tourist guests to the Cassowary Coast region and perhaps onto the Canecutter Way to the Gaudi (Spanish architect/artist) inspired Paronella Park. I wonder if China has a collection of towns devoted to Art Decor? I hope to visit Mackay in August and will stop in town to look see their Art Decor buildings! Wonderful post, thanks for your efforts.